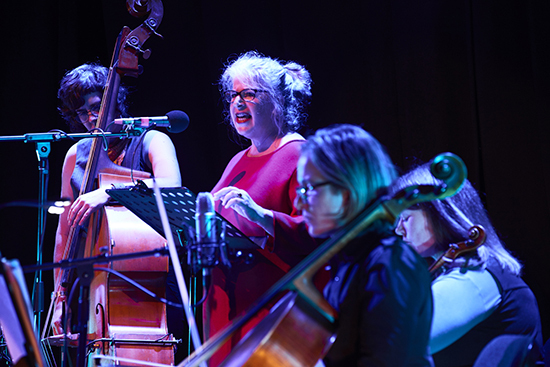 The Book of Daughters, an event presented by JOLT Arts, reminded audiences of the diversity within Melbourne’s sonic art community. Rounding out three nights at the Meat Market in North Melbourne, the third concert featured the Amplified Elephants with Nat Grant, the resident BOLT ensemble with text artist berni m janssen, and Japanese drummer and sound artist Yoshimio. Their three works showcased the female voice in very contrasting settings. To begin the evening, the women of The Amplified Elephants played a compelling set directed by Nat Grant and poet Esther Tuddenham. 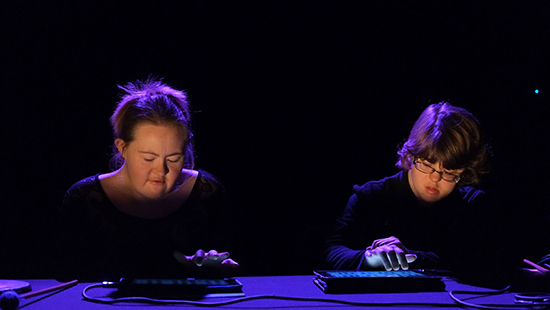 Established by the Footscray Community Arts Centre and JOLT, the group consists of sound artists with an intellectual disability. In its decade-long existence, The Amplified Elephants have performed extensively throughout Australia and in London, Edinburgh and Tokyo, showcasing their unique brand of democratic music-making. As the ensemble worked through different families of instruments—hand bells, cymbals, shakers, guiros and toy music boxes—Grant’s processing and direction was sensitive, resisting the temptation to over-process the recognisable sounds to the point of obscurity. She looped and added resonance to create an echo chamber-like soundscape from the original sources. Subtle references were discernible: the underwater quality of the metallic instruments, the insect-like sounds from the wooden and the gritty yet sparkling white noise of the shakers. Guest text artist and ex-Elephant, Esther Tuddenham, confidently recited two sections of text, with Grant’s processing transforming these into a crowd of voices. The first explored Tuddenham’s relationship with music, while the second was an almost stream-of-consciousness list of affirmations. The text conveyed the power of music-making and served to remind how music and sound art can give voice to those who may not have a platform in other settings. James Hullick’s Slow Riven Whirl, written with dramaturg berni m janssen, was created for the composer’s two young daughters as a reflection on women’s place in society. The text draws from the experiences of four individuals—Sappho, Rosa Parkes, Karen Silkwood and Sylvia Plath—tied together as “women felled by misguided communities.” Performed by the women of the BOLT ensemble with janssen, this was a work full of theatre and politics. Musically, the work was innovatively composed and performed with vitality. To open, the instrumentalists joined janssen in a series of vocalisations. The soft exhales and hisses of the ensemble contrasted with the abrupt gasps of the speaker. Haunting hummed chorales provided points of stillness and reflection, the singing female voices supporting the spoken word. The first entrance of the full instrumental ensemble almost felt disjointed, after the incredibly effective use of voice and sparse bass-heavy scoring. But, with growing intensity and the introduction of each of the four characters, the audience was treated to some fiery and precise playing. The piece followed a trajectory in which the ensemble broke free of its hushed beginnings, mirroring second-wave feminist anger in the time of Plath, Silkwood and Parkes, an anger that had been bubbling under society’s surface since Sappho. With its theatricality, the work was able to reinforce its musical themes and content. The double bass was borne through the the audience on the shoulders of four performers as janssen recited text exploring Plath’s domestic oppression; a macabre reminder of the fates of countless women who still suffer in that sphere. In the section addressing the experiences of Parkes, janssen spoke with a small loudhailer, alluding to civil rights movement protests and expressing the anger and defiance which defined feminism of that time. Janssen’s oration was full of passion and sensitivity. Using her voice to explore female identity politics, she flitted between subversive, acting submissive and indignant, all the while unafraid to use her voice to convey deep frustration and anger. Hullick’s familial voice was never far from the surface of the work and, while obviously a deeply personal work for the composer, there were occasions when the imploring “listen to your father” detracted from the celebration of women—as narrators, subjects, artists and performers. Yoshimio is an intriguing artist, spanning alternative, art, noise and ambient music worlds. 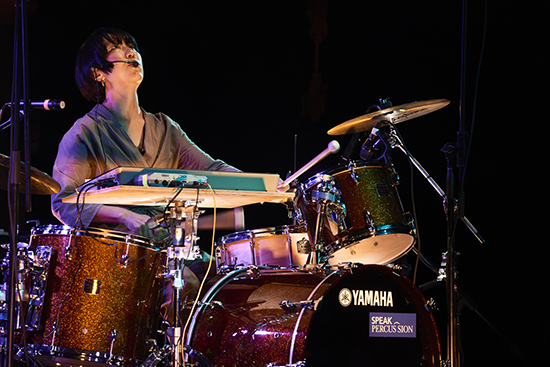 Best known as a drummer, keyboardist and vocalist with bands OOIOO, Boredoms and Free Kitten, her explosive solo set melded her many influences, showcasing Yoshimio as a dynamic and virtuosic performer. With the drum kit close miked, feedback was a constant feature. Sometimes contributing to the overall soundscape, and sometimes taking centrestage, this kind of noise can become physical rather than auditory, unrelenting in the discomfort it has the potential to cause. Adding to the physicality of her electronic sound was Yoshimio’s unbridled use of voice, often distorting to match the pitch and grating quality of the feedback. Where janssen primarily expressed a sort of rational, controlled feminist anger, Yoshimio yelled and screamed in a primal way which, despite the increasing participation of women in noise music, is still fairly shocking and unexpected. A small synthesiser keyboard sat in place of the second tom and was used throughout for either simple minimalist vamps, which were then overlaid with more complex rhythmic ideas from the rest of the kit, or child-like melodies with which Yoshimio sang. These were playful and sarcastic moments, with Yoshimio’s vocals parodying the sickly sweet innocence of the songs before enveloping them within her aggressive rhythmic soundscape. Electronics, vocals and keyboard aside, Yoshimio’s incredible kit playing formed the basis of an exhilarating set which energised the audience. Despite not expressing the overt political and social themes of the previous performance, her work more broadly challenged notions about women in music, providing a fitting end to the festival which had for three nights featured women in both the Australian and international sonic art community. James Hullick and JOLT Arts must be applauded for creating the engaging and diverse program that was The Book of Daughters.